The game has no credits, so I'm not 100% sure who composed the music; The Bomberman The Music album credits Jun Chikuma. 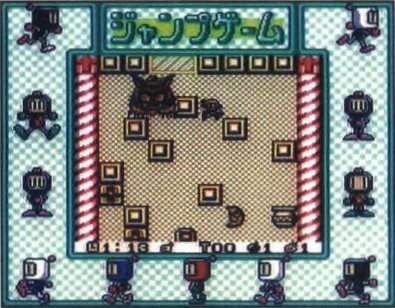 The inexplicable floating heads in the Jump Game are actually cameos of bosses from Tobidase! PaniBom on Virtual Boy. Easy features Bomber Wolf, Normal has Bomber Mummy, and Hard hosts Bompire. The copyright is updated, "BY" changed to "TO", and a trademark is added to the logo. All the area names remain largely the same. The final world is named "Devil" in the Japanese version, though that was tamed down to merely "Evil" in the English release. The previously-monochrome images get a bit of colour up in their business. Super Game Boy borders are translated. And, of course, the English release gets fully colourised; here's just one example. Everything's bright and colourful and a quite hideously garish, with a lot of rather questionable colour choices. Pink killer trees, anyone? Deep red backgrounds? As bad as it looks in the screenshots, it's a bit more subdued on an actual Game Boy Color screen. Besides, what better way to demonstrate the colour capabilities than by assaulting the player with every colour under the sun? You can see the individual world pages, or even just the screenshots page for more examples of the colouring. Only accessible when played on a Game Boy (Super Game Boy removes the option), the Japanese version comes with an extra option on the main menu - GB KISS. BASE NECTARIS has a fantastic page talking about the GB KISS, detailing its features, hardware and all kinds of malarkey. Games with GB Kiss feature a built-in sensor beneath the cartridge, which can interact with games also hosting the sensor and GB Kiss software, or a compatible GB Kiss modem to connect to the internet. This can be used to share text messages, download software, or even exchange game data; Game Boy Wars Turbo and Nectaris GB can use the feature to swap custom-made maps [src], and Super B-Daman: Fighting Phoenix allows players to swap B-Daman without the need for a link cable [src]. Given all this, one would assume Pocket Bomberman might have some form of GB Kiss interaction, but as far as I'm aware it has no connectivity with the main game and is simply an extra feature. It is one of the few GB Kiss titles to have built-in software: KISS MONSTER2, a simplistic monster battling game. It's unclear if it was intended to support the feature, as it stands out as one of the only GB Kiss titles to not support multi-player or link-cable connectivity in any way. From the November 1997 issue of Dengeki Nintendo 64, this appears to be an early version of Forest World Area 2. The platforms above Jacky are three-tile straight lines, and there are two extra tiles on Eyti's side, as well as a missing gate. Eyti is also looking at the camera; that frame of animation is used for its death animation in the final game, but this suggests it was for turning around. The item is a Bomb Pass, which doesn't exist in the final game - well, sort of! 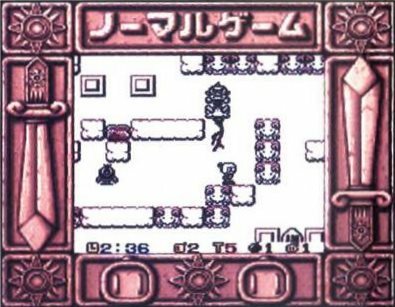 The graphic seen here is unique and does not exist anywhere in the final game's data, or in any other Game Boy instalments. From issue 196 of Computer & Video Games. 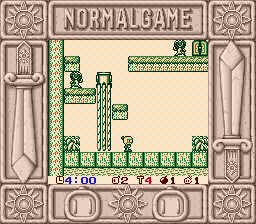 This Jump Game layout doesn't match any of the three maps in the finished product, the lives icon is present, and the gate is open although Bomber Wolf hasn't been defeated yet. A semi-functioning test menu is buried inside the game, allowing you to view the game's screens, tiles, sound effects and more, including placeholder menu and password screens. More information can be found at The Cutting Room Floor. There are four unused soft block IDs that are still functional if edited back into the game. 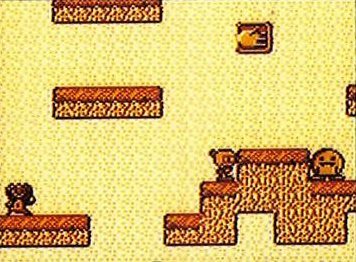 although their icon graphics have been blanked out, meaning the items and even the soft blocks containing them display as white squares. Tile 13 is the Bomb Pass, and allows you to pass through bombs as if they weren't there. Given how much of the game relies on using bombs on platforming, this is a hindrance more than anything. 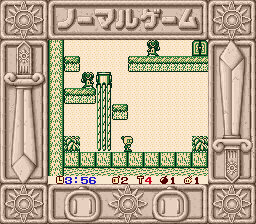 Tile 18 is the Wall Pass, and allows Bomberman to phase through soft blocks without a care. While this might also have had purpose in the likes of Area 5-3, it's also somewhat counterproductive to the whole platform game thing. Tile 1E is a 1UP, and will award you an extra life. There's no reason this shouldn't show up in-game, surely! Tile 19 is the Bomb Kick. Kicked bombs can be stopped prematurely by pressing Up, and otherwise won't stop until they hit a wall or object - they'll even soar across pits! - though they are somewhat less than functional. Most notably, you can only kick bombs to the right! Pushing them left won't budge them at all, and if the bomb is hovering over a gap, trying to kick it will actually stop the bomb's countdown so long as Bomberman is touching it - see right image above. You can play around with these items using this .IPS patch which you can apply to any version of the game. This will modify Area 1-1 to include the unused items stacked on left (from the bottom: 1UP, Bomb Kick, Wall Pass and Bomb Pass), as well as other items to muck around with, though their icons may display incorrectly. Track 5 in the Test Menu's sound test is this sombre little number that I don't think plays anywhere in the game. Bomberman squatting, found next to the jumping frames. A crouch or a transition-to-jump frame? Black Bomberman. This sprite is found next to the HUD graphics for all worlds, which are duplicated multiple times throughout the ROM. Jacky has an animation that suggests it could spit bubbles as a projectile. Springchicken facing left or right. It only ever faces the screen in-game. Several enemies have frames seemingly intended for turning around, but are never used in-game. These graphics are lumped close to each other near the end of the ROM - a bird, a flower, a crumbling stone pillar, and most interestingly, gems resembling the Power Stones. There are five copies of the gems, each with altered background details to fit on each of the game's levels. My best guess is the gems were dropped after defeating each boss and had to be manually picked up. No idea for the birds and whatnot - resources for an in-game cinematic?